From 1904 to now, and looking forward. 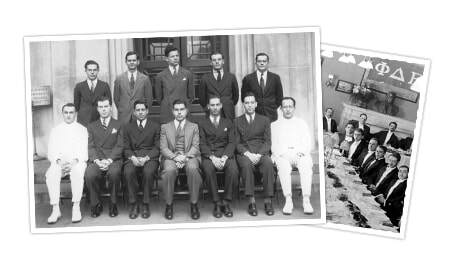 In October of 1904, Aaron Brown and eight of his friends founded Phi Delta Epsilon at Cornell University Medical College. During the first decade of this century there were many doors closed to Jewish medical students and physicians, doors which would not fully open until after World War II. In 1904, it was not uncommon for American medical schools to have quotas limiting admission of Jewish students, and medical fraternities. So, Aaron Brown and his friends decided they would start their own fraternal organization, guided by the precepts of philanthropy, deity, and equity. ​The success of the Cornell chapter soon led to the organization of other chapters in the East and Midwest. In 1918, Phi Delta Epsilon amalgamated with Alpha Phi Sigma, a medical fraternity organized in 1908, whose ideals and principles were similar to those of PhiDE. Its chapters were in the Midwest and West, making for an ideal union. PhiDE celebrated its 100th anniversary in 2004 as a strong, vibrant, professionally directed organization headed for new growth and great excitement. The 21st century beckons us, and we continue operate under Aaron Brown's guiding principles of Philanthropy, Deity, and Equity as largest premedical fraternity in the world. Phi Delta Epsilon has grown from a small insular group to a diverse, all-inclusive organization. We have done this by making our motto live: Facta Non Verba, Deeds Not Words. And, indeed, we will continue to prosper, grow, and spread the warmth of our brotherhood in the future. "Facta Non Verba, Deeds Not Words"
We hold these values as our legacy, and hope to not only embody these values as physicians in the future, but to inspire future generations to do so as well. ​and how we represent and uphold Phi Delta Epsilon's values and legacy.